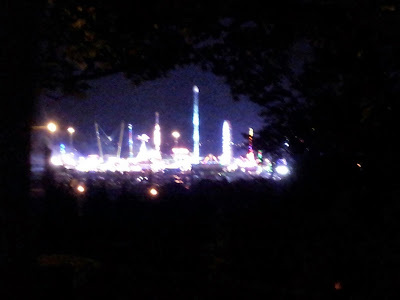 So I went to Goose Fair on Thursday and Friday and totally loved it! The weather wasn't the best as it was raining quite a lot, however I had a lot of fun! On Thursday I went there with my family, I wasn't feeling very well so I didn't go on any extreme rides, only the ghost train and bumper cars. I can tell I will be an amazing driver already hehe ;) I had a lot of fun when I went to it with my friends on Friday, until I smacked my head on a metal bar on one of the rides :( it left me with a big lump at the back of my head and it has been hurting non stop ever since :/ I'm too clumsy! I love winning little prizes! I did the hook a duck challenge and won a little care bear woo! I love Goose Fair food, I couldn't help myself but buy flying saucers, toffee and chocolate apples and sour worms! Mmm and also a few cans of mushy peas ;) I love it! The weather was much better on Friday than Thursday, so that made the day slightly better. Anyway, here are some pics to sum up this years Goose Fair.